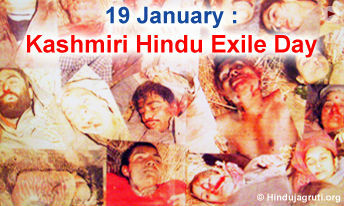 Aum: 19 January : 'Kashmiri Hindu Exile Day' ! India will celebrate its 63rd Republic Day on 26 January 2012, but still lakhs of Kashmiri Hindu Pandits are living as 'refugees' in their own country. These Kashmiri Hindus had to flee away from their ancestral homes on 19 January 1990 due to fear of Islamic Militants. Today lakhs of Kashmiri Hindus are living in very much pathetic conditions in different parts of India and many of them died as they were not able to cope up with the climate change and worst living conditions. O Hindus, now it is high time for us to get united and establish Hindu Rashtra to avoid 'Atrocities on Hindus' ! You received this message because you are subscribed to the Google Groups "hindupride" group.